ThingOne's language seems to have taken another leap. It's fascinating to watch her brain develop, and to notice the leaps in understanding she makes. An early stage of this resulted in her having several names for her family members. Anne and I joke that with ThingTwo's limited faculties she must look at Anne as 'Milk' and me as 'No Milk', since that must pretty much sum up what she needs to know about the differences between us. Well, with different terms this now seems to actually be the case with ThingOne. She would often go through the list of "Daddy's big, Mummy's medium, I'm small, and ThingTwo is tiny." We realised that these had become more than just adjectives one evening when she called out to her mum from bed, shouting "Mummy!" Anne was busy, so I went up to see ThingOne. I wasn't welcome. "But I wanted Medium", she said indignantly. I didn't understand. "I wanted Medium, not Big", she clarified and I realised what was going on. Apparently only Medium would do. She was pretty annoyed that I'd dare to visit her. Silly me. One day this week we were in the car and ThingOne asked who would take her out of her car seat when we parked. I told her she could choose. "I choose Hairy", she declared. I assumed that was me. "I want Hairy to get me out, not Smooth". So apparently Anne and me are now Smooth and Hairy, names derived from facial hair. Flattering. Thanks ThingOne. Since we found that ThingTwo is allergic to bananas, ThingOne often now differentiates her and ThingTwo (differentiation already - my mathematician daughter!) as The One Who Can Eat Bananas and The One Who Can't Eat Bananas. The workings of her brain are really a wonder. Other advances in her language tend to be almost entirely due to the TV show Charlie and Lola. She quotes it a lot, and we frequently only realise that a new phrase she uses is a quote later. Last week Anne took her to the theatre for the first time to see a stage show of The Tiger Who Came To Tea. ThingOne loved it (though had it in her head she was going to see Batman). At one point 'stars' appeared around the theatres. "Oh it's so pretty", ThingOne announced in a whimsical voice. Anne found this rather strange but very cute. Later that day ThingOne requested a specific episode of Charlie and Lola, and we realised that Lola says the same thing in exactly the same tone. Last night, Anne was out for the evening doing something for work (her maternity leave is just finishing). ThingOne knew this, and she summoned me upstairs a few times in the evening. "I'm sad because Mummy isn't here", she whimpered. I knew she wasn't. She was being a drama queen and looking for an excuse not to go to sleep. Nevertheless I comforted her, because I am a fabulous person with the patience of a saint. "Mummy will be back soon ThingOne, she always comes back", I assured her. At this point her tone of voice became very dramatic, and slightly wobbly: "But Daddy, everything is different now". What? Where did she get this? She said it with such a small, sad voice that it should have broken my heart, but I could immediately tell she'd picked it up somewhere and was just trying it out in a vaguely appropriate context in order to defer bedtime. What a drama queen! We fully expect to see an episode of C&L soon with that line in. On an unrelated note, ThingOne and I started a craft project today. 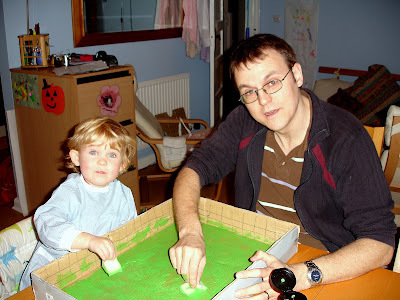 We're making a farm. 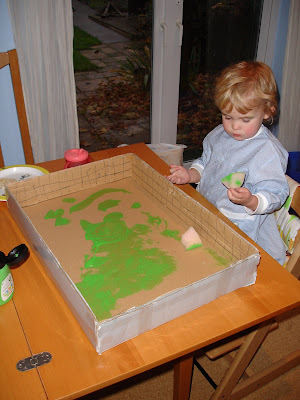 It started with a cardboard box, and today we painted the base green (to represent grass, you see?) Not sure how far this project will go, but she seemed to enjoy it today so it could be a runner.